... margarita was born today. she looks just like her brothers, mojito & cosmo ... i think it's because they hatched from the same kolibri egg. there's still a bit of this yellow kolibri leftover ... a little bit from each of the three balls i worked with. i may be able to squeeze out one more chicken. i figure if i run out, i will just finish it with some double stranded embroidery floss. 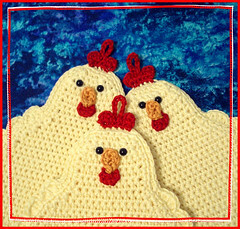 i have been enjoying making these chickens, and they are using some stash, though just a little bit, that otherwise would still be occupying space. this yarn was originally earmarked for socks. i don't know what i was thinking. i unraveled a partially knitted sock to use the yarn for cosmo. on sunday, i hope to do some stash evaluation, and see about recovering and reusing yarn from long ago abandoned projects. i also need to drop some stitches and make a repair on the larger cable of my aran heirloom afghan. i had run away from the afghan to the chickens because i was so distressed that i had messed up the cable, and i couldn't find my 10.5 dpns to fix it. sunday. yes, i will get to it on sunday. Must get a chicken >>>> Would you swap for something??? oh, i would love to trade. i love trading! but all these chickens already have adoptive parents waiting in the wings. it's a short list, as i will likely only be able to squeeze four chickens from this small stash of kolibri, but of course, mom is at the top of the list. ... perhaps when this diet is over? I love that afghan in fact just bought the 2000 issue of the magazine, but when I saw it takes 8000 yards of yarn - yikes! What yarn are you using for it?